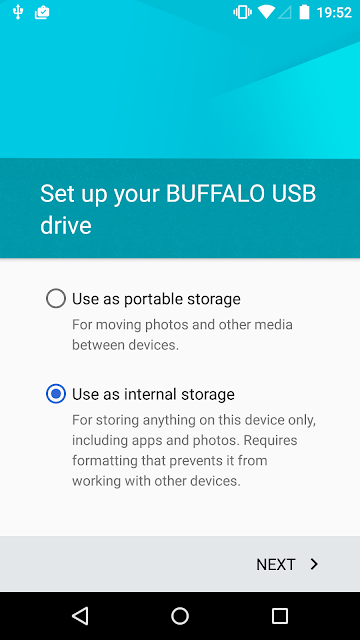 This doesn't require rooting your phone and lets you backup application data, both user installed and system applications (APK's), as well as shared storage (SD card) contents. There are some limitations though: it won't backup apps that have explicitly forbidden backups in their manifest, it won't backup protected (with DRM) apps and it won't backup some system settings such as APN's and WiFi access points. The transfer speed is limited by ADB channel speed (less than 1MB/s), so full backups can take quite some time. There is also a rather annoying bug in 4.0.4 where it will backup shared storage even if you don't request it. With all that said, it's a very useful tool, and will hopefully see some improvements in the next Android version. is written to "backup.ab" in the current directory. The restore command is however quite limited -- there are no options, you can only specify the path to the backup file. One of the features most noticeably lacking is conditional restore: restores are all or nothing, you cannot restore only a subset of the apps (packages), or restore only the contents of the shared storage. Supporting this will require modifying the firmware, but you can extract only the needed data from the backup and copy it manually. Copying apps and app data to your device requires root access, but extracting and copying external storage files such as pictures and music can be done on any stock ICS device. And if you create a backup file containing only the files you need to restore, you wouldn't need root access at all. 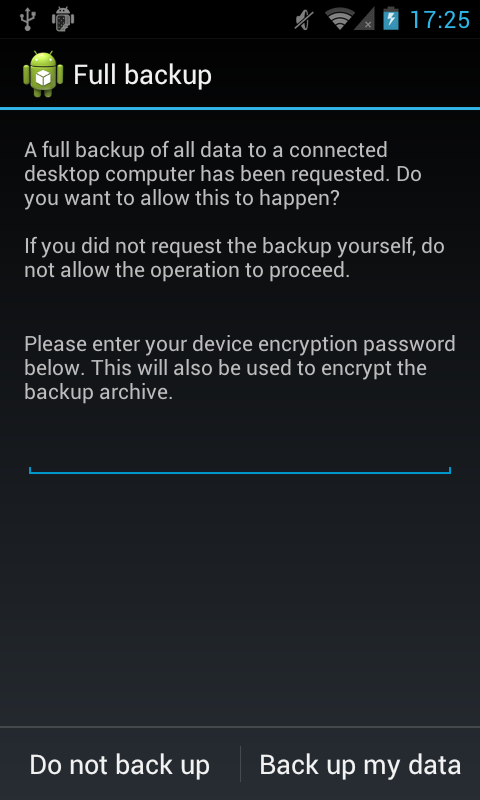 This post will present the format of Android's backup files and introduce a small tool that allows you to extract and repackage them as needed. SDK API's for using Android's backup architecture were announced as far back as Froyo (2.2), but it has probably been available internally even before that. As introduced in Froyo, it uses a proprietary Google transport to backup application settings to the "cloud". ICS adds a local transport that lets you save backups to a file on your computer as well. 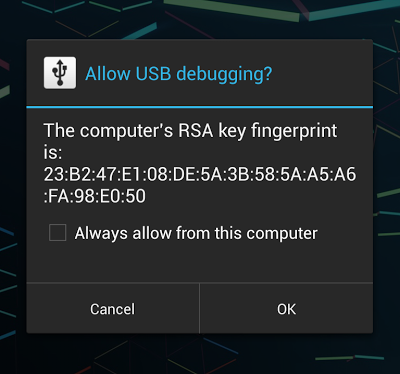 The actual backup is performed on the device, and is streamed to your computer using the same protocol that adb pull uses to let you save a device file locally. When you execute the adb backup command a new Java process (not an activity or service) will be started on your device and it will bind to the system's BackupManagerService and requests a backup with the parameters you specified. BackupManagerService will in turn start the confirmation activity shown above, and execute the actual backup if you confirm (some more details including code references here). You have the option of specifying an encryption password, and if your device is already encrypted you are required to enter the device encryption password to proceed. It will be used to encrypt the archive as well (you can't specify a separate backup encryption password). The first line is the file 'magic', the second the format version (currently 1), the third is a compression flag, and the last one the encryption algorithm ('none' or 'AES-256'). App data is stored under the app/ directory, starting with a _manifest file, the APK (if requested) in a/, app files in f/, databases in db/ and shared preferences in sp/. The manifest contains the app's version code, the platform's version code, a flag indicating whether the archive contains the app APK and finally the app's signing certificate (called 'signature' in Android API's). The BackupManagerService uses this info when restoring an app, mostly to check whether it has been signed with the same certificate as the currently installed one. If the certificates don't match it will skip installing the APK, except for system packages which might be signed with a different (manufacturer owned) certificate on different devices. Additionally, it expects the files to be in the order shown above and restore will fail if they are out for order. For example, if the manifests states that the backup includes an APK, it will try to read and install the APK first, before restoring the app's files. This makes perfect sense -- you cannot restore files for an app you don't have installed. However BackupManagerService will not search for the APK in the archive, and if it is not right after the manifest, all other files will be skipped. Unfortunately there is no indication about this in the device GUI, it is only shown as logcat warnings. If you requested external storage backup (using the -shared option), there will also be a shared/ directory in the archive as well, containing external storage files for each shared volume (usually only shared/0/ for the first/default shared volume). Full code for the backup pack/unpack utility is on github. Keep in mind that while this code works, it has very minimal error checking and might not cover all possible backup formats. If it fails for some reason, expect a raw stack trace rather than a friendly message. Most of this code comes straight from Android's BackupManagerService.java with (intentionally) minor modifications. If you find an error, feel free to fork it and send me a pull request with the fix. Untar, modify, then tar again and pack using the provided utility. What files are you modifying? My guesses for the error: my data file's size - it's about 10GB; on the xda post about the perl utility, there's some talk about the first part of the file actually being compressed but the second part isn't - perhaps that's the case for me. When the Java app dies, the file that is created does seem to be a valid tar other than it doesn't contain all the data. So far have tried the Java utility on my mac and the perl scripts on my mac and a Ubuntu 8.04 box. Sounds like you've hit the external/shared storage bug indeed. Unfortunately the extractor tool doesn't handle this automatically. What you can do is (carefully) extract the shared storage part from the archive with a binary editor, and that should leave you with a valid backup for /data and /system. Then you should be able to use the Perl script to convert the extracted part to a tar file, so that you can restore /sdcard. I think the XDA post has some hints about this. Yes, I mention this in the article, but it only works for unencrypted backups. And if is password encrypted, which will be the command? I've checked your github, but my java installation is not in "/usr/local/jdk1.7.0_04/bin/java" but in "/usr/bin/java"
The path in the script is just a sample, edit to fit your environment. Run the shell scripts without parameters to see usage. If you meant what the openssl, etc. standard command is, there isn't a direct one. You have to read the header and do some processing to derive the decryption password. It could probably be done in a shell script using some combination of sed, grep, awk and openssl, but it won't be pretty. If you don't want to use Java, check out the Perl scripts on XDA, or use your favorite scripting language to port the decryption code. Apparently, the tar generated by either the java method or the dd and zlib one, seems to generate invalid tar streams. Are you experiencing the same issue? Not but, I haven't used the --delete option either. In any case, you need to delete not only the apk, and preserve the file order to able to restore. What works for me is unpacking, deleting the file and re-packing. See the last part of the article. The text file used with -T weights 495 KB, while getting the list of the tar results in 3.7 MB, so something went wrong. Did you ever experience this issue? I'd suggest creating an minimal backup to experiment with (a couple of packages, etc.) so you can keep track of your changes. How to detect what apps / files are being specified not to be saved to adb backup? Where are those settings? Which exact flavour and version of Tar are you using to pack the tar archive? Nice write-up. I sure like your abe.sh utility. It proved much faster than dd due to the block size being limited to 20 bytes. Thanks, glad it work for you. The Java code is using a much larger buffer and compression speed should be comparable to zlib's (I think Java SE uses native code for this), so in general it should perform better for larger backups (I haven't done an actual benchmark though). Well, your project on GitHub seem down. Would you like to share the unpack utility for windows? Github seems OK to me. Temporary problem? As this is written in Java, there is no Windows-specific version. /home/reki/android-backup-extractor-master/build.xml:15: Compile failed; see the compiler error output for details. Do read the blog post first. Use Java 7. 2. Before restoring the application, remove it from the target. 6. Create a new TAR file containing the files. Note how each file is added individually AND notice that the apps directory is not preceeded by ./ but is just using the directory name. That uses dd to skip over the first 24 bytes, and allows cat to take over funnelling the stream later. Thanks for the information on the file format. I've created some tools for my specific needs. I am sharing in case it is useful to someone. How in the world do I start this software or whatever you call it. I have no clue what I'm doing and I've read this thing twice and still don't understand. Also I'm trying to open an encrypted backup. You need to install the unlimited strength JCE policy so that Java can use larger key sizes, as used by the backup encryption. Caused by: java.lang.RuntimeException: java.lang.IllegalStateException: Invalid password or master key checksum. Caused by: java.lang.IllegalStateException: Invalid password or master key checksum. 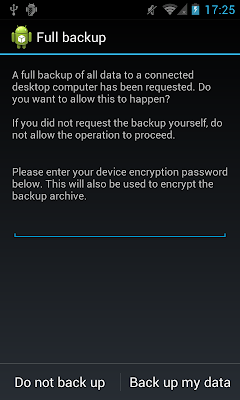 I am unable to extract it with the the Android Backup Extractor. Could you please help me out? I am using a Mac computer. Would it be possible if I send over my file for extraction? I'm getting the error as in Dakota's second post. Running Kubuntu 12.04 with adb 1.0.31 for Linux. Downgraded from Android 4.4.2 to 4.3 on Nexus 7 2012. Trying to restore from adb or Ti Backup does not work. Can't be sure what the cause is, but there is a bug in 4.4 that might trigger this. Get latest code from Github and try with that. i'm getting error like this..
You should contact Helium support to find out if the backup files it produces are in the same format as native Android backups. You can also look at the header at the file to see how if it looks the same as what is described in this post. I have a Nexus 5, I've just updated to 4.4.3 and the adb backup version was changed to 2! The backup extractor prints the message "Don't know how to process version 2" Any chance for you to update your extractor please? Looking on github through the BackupManagerService.java history, this change introduced the new version: "Adapt to underlying changes in the PBKDF2 implementation"
well, given that the change seems to be only because of cryptographic reasons and my backup not being encrypted I hex-edited the ab file and changed '2' to '1' and the extractor works. Yes, I saw that change. I will update the program to accept ver 2 when I get a chance. For now, you can simply change the version to 1 manually (as you did), it should work even if the backup is encrypted, because the program tries both algorithms if the first try fails. Or, if not encrypted, use the OpenSSL method, it simply skips the header, so the version doesn't matter. I've updated the code to support backups with version 2. Use the 'pack-kk' command to create ver to backups (maybe I should change it to pack-v2 or smth). Build the extractor tool from the latest code Github if your backups are encrypted, otherwise just use OpenSSL to decompress. This is not the latest version. The latest version handles backups with ver=2, but you have to build it from source. Why do you want to create an uncompressed backup with adb? There is no such option, so it can't be done without modifying the Android build (ROM). This refers to Android source code (BackupManagerService.java). It simply means that the tar file inside the backup is not compressed. Helium is probably changing something at runtime or they have their own implementation of the BackupService. Not idea why they would turn off compression though. You can't achieve the same thing without writing code and messing with Android internals. If openssl is configured without zlib support (debian like systems), you can also use "zlib-flate -uncompress"
Unfortunately am in the same position after using adb to take a "full backup" of my nexus 4 before proceeding to wipe/unlock. Any chance you have some pointers over how exactly to extract the shared storage part from the archive with a binary editor? 1. After modifying/editing/deleting files from an extracted android backup using the method in your readme file, do I have to update the manifest file before packing and restoring the modified backup to my device? If yes, how do I modify or update the manifest file? As I saw, it just contains some numbers. What are those numbers? 2. For apps that disallow backups, how do I change the "allowBackup" in the manifest so that I can backup using adb again? Where is the manifest file in the apk? Is it possible to modify this? You can find detailed guides about repacking backups on XDA, etc., but it's generally tricky because order and format needs to be preserved. IIRC, it should work even if you don't modify the manifest, but do test on a recent Android version. You cannot change allowBackup unless you have root, but once you do, you can access data directly anyway. I searched everywhere. Repacking is done using the same method as I did by creating a list of the tar file, editing the list file without changing order and converting it back to ab using star or pax. But there is no information anywhere about the manifest file. What do I do with it? I just want to know the way to update the manifest file. I want to know even if backups work without updating the manifest. By the way, the restore worked with the above method on lollipop. I just want to know how to update the manifest. Please tell me. Why don't you answer? Did I say something wrong? :( I couldn't find how to edit the _manifest file in the internet. That's all I want to know. Please answer. Yes, I read the READMEs before. It's written. - When adding or removing files for an app you may need to edit _manifest so adb restore accepts the changes. Thank you. I didn't need a guide, just a hint 'cause I don't know anything technical. I'll use my intelligence to experiment with it. I've to find out how to find those values now, especially the signature part. I have to find out how to obtain the hash of the key so that the manifest can be modified if necessary. If you already know it, please share it. :) Thanks. Using "tail -c +25" instead of dd is also much more efficient. If I try pax, it says ustar header too small. I couldn't find a solution. Please help. Thanks. It has worked for me before. I don't know what's the problem. Trying to unpack a Sony Z2 encrypted backup. Any idea why it fails and what to do? You need the unlimited strength policy files for JCE, read the blog post for details. Hi I was also wondering how you convert from tar to adb using version 3. Many thanks. Using tar -T ended up including the directories, so that every file was in the tar archive twice - this is because the original listing made with tar -t included both directories and files. Fix was to manually delete the files from the listing (tar -tv | grep '^d' will show just the directories). since my openssl didn't have a zlib command, i found zlib-flate -uncompress worked instead.